"We are remodeling our utility room, not moving walls, but have removed a closet to add cabinets and new counters. The room was a bit of a mistake when we built in that it is smaller than what was planned. The cabinets are beige with some taupe/tan veining and the floor is ceramic greys/beige/white - white grout. Wallpaper will be decided once I have chosen counter top colors. I brought home a sample of Caledon and Blue Pearl - I see many rooms using the Caledon but not Blue Pearl - there are other granite colors to see, I am sure, but these are what we liked at our first stop. Do you have the Blue Pearl done in a room to see? What are your thoughts on the color combination?" Thanks for the email Kristina. 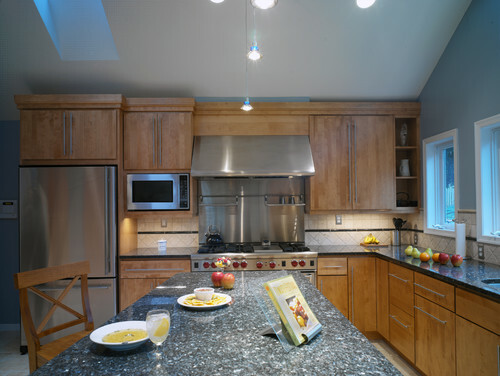 Blue Pearl is a really beautiful granite. I think the color combination would look great. The blue in the Blue Pearl would give some life to all the browns/tans/ taupes & whites that you are using. It's also a great color to use in a utility room. It's a really durable granite and will hold up well. Here are some pictures I found that have Blue Pearl on tan cabinets. Hopefully this gives you some inspiration! contemporary kitchen design by dc metro kitchen and bath Case Design/Remodeling, Inc.
For more pictures of Blue Pearl go here for our Slab Sunday. If you have a stone or design question you'd like to see answered here please send me an email.